With snow still covering the landscape in the North Woods and a late-arriving spring, there are concerns about the severity of the winter on wildlife. 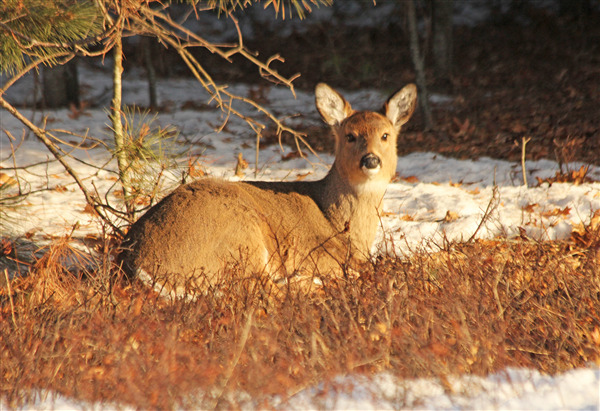 While the winter started slowly with limited snow in December and January, recording-breaking snow amounts fell in February raising the concern for wildlife, especially deer, turkeys and grouse. Michele Woodford, De­partment of Natural Re­sources (DNR) wildlife biologist in Woodruff, said for the most part deer are in good health at this point with no reports of high mortality in deer yards. “We would like for people to submit reports of any issues in deer yards (three or more dead deer in a single location, for example, would be a red flag),” said Woodford. “I’ve not heard of any die-offs. We’ve been out to check on a few dead deer and so far have not found anything unusual for this time of year. Woodford said assessments done so far this year show deer to be in better condition than they were at this same date last year. This winter, the big snowfalls didn’t arrive until February, when more than 60 inches fell in parts of the North Woods. There are currently about 14 to 16 inches of snow in the woods. Woodford and other state wildlife biologists can use the winter severity index (WSI) to compare the impact of the weather on wildlife. The WSI is calculated by adding the number of days with a snow depth of at least 18 inches to the number of days when the minimum temperatures were below zero. The WSI points accumulate during the winter, allowing DNR wildlife experts the ability to compare the severity of the winter from year to year. A WSI of 49 or less is considered mild, 50 to 70 is moderate, 80 to 99 is severe and 100 or greater is very severe. With the recent warmer weather, the snow depths have dropped dramatically from about 36 inches in the middle of March. Woodford said cold nights provide a snow crust that allows grouse and turkeys to walk on it. Woodruff said population estimate models are using winter severity (and the rates of mortality based on the index) to calculate prehunt 2019 herd estimates. “For example, we plugged in a winter severity index of 90 points for Vilas even though when the model was set up, actual WSI (through February) was only at about 50 points when the models were run,” said Woodford. The thick ice and deep snow on lakes also could result in some fish kills, according to Steve Gilbert, Woodruff Area fisheries supervisor for the DNR’s Bureau of Fisheries Management. Gilbert said people that suspect that a winterkill has occurred on a lake should contact the local biologist so that they can follow up on the report.